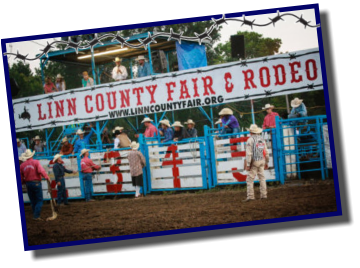 The Linn County Fair, Origin and History by Wayne Schasteen In 1870, still recovering from the Civil War, the first fair in Linn County was held. The passage of the Kansas-Nebraska Act in 1854 had provoked border conflicts and some of the most brutal struggles took place in Linn County. With Missouri on the eastern boundary, Linn County was in the heart of "Bleeding Kansas." The War left many casualties but the pioneer spirit prevailed, and soon this rich agricultural region would yield bountiful harvests again. As a result of this, the Linn County Fair was started. As an event where friends and neighbors met to display the fruits of their labor. It remains one of the largest and best fairs in the state of Kansas. The origin of the fair dates back to pre-Christian times when herders and merchants would come together at festivals to exhibit and sell their wares. During the sixteenth century in England, privately owned marketplaces in the cities largely replaced fairs and livestock markets. In America, some fairs became so large that they assigned certain days for classes of entry, generally providing nightly games and entertainment. The farming regions of the Midwest regarded fairs as the social event of the year. The farmers of Elm Grove in Linn County Set out to have an organized fair. In 1870 and 1871, the Elm Creek Farmers' Club held annual fairs during October in Scott Township, presently known as Cadmus. They had livestock exhibits which could have competed proudly with the best at the Kansas City Exposition. There was hardly a person in the county who would not lend assistance to such an organization, or benefit from it. In 1872, it became the first fair in the county to offer premiums, until that time participants had to attend the Kansas and Missouri fair in Ft. Scott for that kind of competition. Under pressure from county residents the Elm Creek Club incorporated and became the Linn County Agricultural Society. On November 2nd, 1872, they elected officers: President, J.J. Shinkle; Secretary, J.C. Proctor and A.G. Sailor; Treasurer, J.W. Payne; Directors, M.E. Woodard, J.J. Shinkle and Z. Leasure. 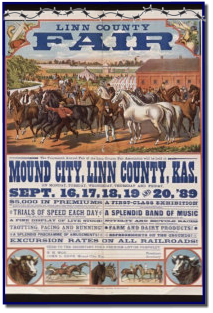 The site for the first Linn County Agricultural Society Fair in October in 1873 was Farlinville, Kansas. When the failure of a leading investment bank brought on the "Panic of 1873", a depression in the United States that lasted four years, the Agricultural Society did not slow down. A.E. Drigs and W.L. Silsby provided a race track south of Farlinville. Displays of produce filled the newly erected tents and livestock filled the grounds, featuring the finest Shorthorn cattle and Berkshire hogs in the land. One of the most important exhibits of the fair was specimens of lead ore taken from various locations in the county. Other events included carriage horse shows and equestrian events by the ladies who were in attendance, and foot races for the young men. One surprise entry in the races was a young black man. Several white men who entered the race refused to run against him. He easily took the lead perhaps revealing their true motives for not welcoming him into the competition, but the young black did not win the race. Before coming down the home stretch, he turned around and ran backwards. Until the others passed him, giving away the first prize and adding a bit of humility to the winner's ribbon. The first exhibitions' success in Farlinville inspired the society to make greater efforts for the 1874 fair. The proposal of LaCygne Kansas citizens in 1874 encouraged the directors to hold the second annual Fair in their town A meeting of interested citizens planned to lease thirty acres on the north edge of town. Before opening day, the acreage had been cleared, fenced and a splendid half-mile race track was completed, making it one of the finer exhibition spots in the Midwest Despite the combined efforts of cinch bugs, grasshoppers and drought the fair proved to be very successful The usual displays of livestock, produce and sewing gave the crowd d plenty to see A yoke of buffalo shown by Josh Shaefer of Middle Creek added a bit of novelty to the fair. The area equipment dealers demonstrated the newest technology in implements, made to ease the labor of everyday farming. The Linn County fairs took on many changes in 1875. The Agricultural Society in LaCygne purchased the land they formerly leased and built a Floral hall in the form of a Greek cross, along with other various buildings. Baseball added more excitement to the festivities along with baby contests and horse racing. Toward the end of 1875 the Lion County Agricultural and Mechanical Association incorporated purchasing sixty acres of land near Mound City. With J.F. Broadhead as president they sold shares to raise capital for land buildings and an amphitheater. These two agricultural societies exhibited Linn County's desire for progress in the agricultural areas. In 1876 the people of Linn County could attend two excellent fairs. One in LaCygne under the authority of the Agricultural Society and the other in Mound City sponsored by the Agricultural and Mechanical Association. The one in LaCygne was listed as the Linn County Fair. On October the 4th. 5th and 6th. Later in the month, the First Annual Fair of the Linn County Agricultural and Mechanical Association began at Mound City. Many people attended both fairs to see the hundreds of entries from farmers merchants and housewives of the local communities. The competition between the two organizations benefited fairgoers, as each tried to create a larger and more spectacular event. The organization both held fairs over the next few years. From 1884-1889 the Pleasanton Kansas Fair Association sponsored their own fair. During these six years Linn County offered three different fairs for people to enjoy and attendance records show that most people in the area attended each of them. In 1905, the Linn County Fair Association replaced the Agricultural and Mechanical Association. A.H. Mantey purchased the fairgrounds and leased it to the Fair Association each year. The Fair Board then built a one race track and grandstand. The 1906 fair offered some of the most spectacular events yet, complete with balloon ascensions and boat rides. There were thrills for everyone. Over the next few years, the fair reflected Linn County's prosperity. Starting with the Grange picnic and Coach Colt Show in 1907, Blue Mound conducted a main street fair for about the next thirty years, Even though all three towns still held Pairs the one in Mound City grew to daily crowds of 6000 people. During World War I county fairs often demonstrated patriotic themes in support of the troops overseas. After the War Linn Countians enjoyed a bit of prosperity until the stock market crash of 1929. This put the United States in a depression that would last ten years, and leave thousands of Americans unemployed. Despite economic hardship the fairs continued during the early thirties featuring harness races and professional wrestling for everyone to enjoy along with the regular agriculture exhibits. At a meeting of in August of 1936, the directors decided to cancel the fair in Mound City. Because of the continued dry weather, the board believed attendance would be small and agricultural exhibits not very significant. The fair was held at LaCygne in 1936. Even though many displays showed the effects of dry weather, it was a great success for the young people of Linn County. In 1937, a complete fair and stock show began in LaCygne under the sponsorship of the A.T.A an organization joining the Agricultural Society in 1913. The installation of lights let everyone beat the heat and still enjoy the horse show and races after dark. In 1938 the Linn County Fair Association voted to once again conduct a fair at Mound City. After canceling the event at that location for the last two years, the fair board decided on a rodeo for entertainment A parade passed down the main street of Mound City using "Settlement Days" as a theme. The parade featured horses, covered wagons and Pete Data's Cowboy Band. The financial situation of many people kept them from the fair but the addition of the rodeo did help attendance in the afternoons. Both fairs continued until 1940 when the Linn County Fair Association merged with the fair at LaCygne. The primary motive of the fair was promoting agriculture and the livestock industry. The combined efforts provided improvements in every area, encouraging the 4-H and vocational students in the county to do their best. World War II had an impact on the fair During the war, many things were in short supply, People used ration coupons for items such as fuel, sugar, tires and shoes. Many items were contributed to the war effort such as scrap metal, clothing and tires creating a recycling trend much like today's. In 1943, the Fair Board did not lease the grounds from Mr. Mantey. Instead they decided to hold the fair across Sugar Creek near the Mound City water plant. It was advertised in the paper as the 4-H Fair and Crop Show, Sept. l-3. At the suggestion of Dr. L.D., Mills, county health officer the fair was canceled that year due to increasing cases of infantile paralysis. In 1944, while most people were using their efforts to fight the war on the home front, the fair was canceled once again. The Fair Board, not wanting to slow the efforts of the young people, decided to hold a 4-H show. Since they had not secured a lease for the fairgrounds that year, it was held on the main street of Mound City. Under the management of Carl Teagarden, crops and clothing were displayed in businesses and the livestock were kept in Peatman's used car lot. 1946 brought on one of the most significant events in the history of the fair. Board members set out to sell stock certificates to raise enough capital to purchase the fairgrounds. Many shares were sold and a number of donations accepted. Shares were ten dollars each or half of a share for five dollars J W. Farrar, an attorney for the livestock exchange in Kansas City, helped out by purchasing fifty shares. The Federated Clubs of Mound City acquired twenty shares but most were sold one or two at a time to local residents. This gave the board enough to pay the $5000 needed to purchase the grounds, The Linn County Fair would, as it still does today, have a permanent home. Another important part of the Linn County Fair is the 4-H clubs. Before their existence the baby beef clubs were formed. Many of the counties leading citizens purchased calves, which members of the club raised until fair time. The cattle were then judged, and prizes awarded to the best. Walter Daly came to Linn County in 1927 as the first county extension agent. A full 4-H program was then developed and clubs were given names such as Busy Bees, Willing Workers and Busy Workers to reflect their attitudes toward involvement and community service. Over the years Linn County 4-H clubs have been a strong backbone of the fair. At times when open class entries were not plentiful, the 4-H clubs kept the shelves and barns full giving everyone in attendance a chance to see the efforts of their yearlong work. Midget auto races attracted fans at the 1949 fair. The same troupe featured at the Kansas State Fair in Hutchinson thrilled fans as they turned sharp corners at 40 miles per hour and reaching 70 as they flew down straight-aways. KMBC radio entertainers were top billing at the variety show. The rodeo featured riding, mule racing, trick roping, knife throwing and whip cracking. It was a constant struggle to ensure the continual growth of the fair. 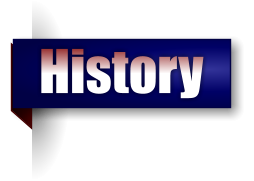 Two things happened in 1952 which help to this day. One was the permanent addition of a rodeo. While the rodeo raised attendance, it also brought in revenue from ticket sales. Until this time, the fair usually charged fifteen to twenty five cents for admittance. With the increased money from the rodeo, the admission cost was eliminated and in 1953 it was advertised as the Linn County Free Fair. In l954, the fair signed a contract with Robert's Rodeo from Strong City, Kansas. They were also approved by the R.C.A. which let the audience see many world class cowboys compete. Robert's Rodeo worked with the fair until 1966. 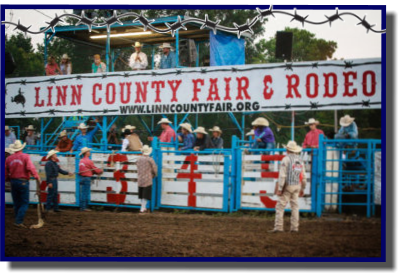 The board then entered into contract with Rumford rodeo from Abbyville Kansas, which still provides top stock to help the fair maintain a strong attendance. The second event the fair sponsored in 1952 was the "Queen of the Linn County Fair Contest." The queen contest was another way to ensure good attendance, thus keeping it a free Fair Each queen contestant was sponsored by a Linn County Organization or club The contestant and her sponsor would sell advanced rodeo tickets and whoever sold the most was then crowned queen. The winner received clothing or gift certificates. In later years, the contest was changed to the Linn County Rodeo Queen. Now they receive a percentage of their sales and each contestant wins a trophy buckle if they reach a specified goal. Many times over the years the fair would have a specific theme or idea In 1954, the theme was the Kansas Territorial Days Centennial. It started with a parade through town and ended at the fairgrounds. A pageant that evening entertained the crowd. One of the largest celebrations was in 1961, the centennial of Kansas' statehood. The pageant that year had a wonderful cast of local characters from throughout the county. They acted out scenes from the past including Sister Philippine Duchesne and the Indian mission, Carrie Nation, Jayhawkers and even local African American residents as exodusters. Entertainment has always been a big part of the fair. In the early days there were horse racing, games for the children and music of various forms. Carnivals became a big part of the fair with giant Ferris wheels and games of chance, giving the younger audience something exciting to do. One of the most traditional forms of entertainment, The Cowboy Band made up of local residents to provide music, is no longer in existence. The band performed nightly during rodeos and races and in the annual parade rode in the Mound City Bandwagon. During the 1930s and 40s the band was under the direction of Pete Data and in the later years Harrison Underhill. In the 1980s, the board took a new approach to providing entertainment. They started booking country music performers. Reba McEntire appeared in 1985 when she was chosen as country rnusic's entertainer of the year. The biggest event ever held at the fair was in 1990, when Garth Brooks appeared. Both of these acts were booked prior to their making it big. This gave fair goers a chance to see performances for a fraction of the price they would pay if they drove to a larger city. Over the years the fair has gotten larger, even though the population of the county has declined. Linn County had 12,000 residents during the late l800s, and only 7000 today. Linn County's per capita income is one of the lowest in the state of Kansas. And it also has some of the highest unemployment rates of any county in the state. There is no large town with a, factory or employment base. The largest part of Linn County's tax base is a coal - fired generating station in LaCygne. It is also the largest employer in the county. Mostly Linn County is a rural farm community, a big reason for the popularity of the fair. The fair has had many locations in the county over the years, but it has always contained the same basic format. The hard working people of Linn County displaying their livestock and agricultural products. The people behind the scenes at the fair have always wanted it to be a place for the youngsters, whether they were 4-Hers or just kids wanting to have a good time. It also drew the family unit together, in the early days many people would load neighbors into wagons and make the journey to the fair. In recent time many working parents schedule their vacations around the fair. One of the largest draws people to the fair its simplicity. 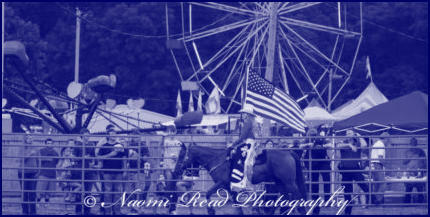 At a time when every thing is fast paced and high priced a person can enjoy going to the fair. It does not cost anything and you can sit and relax or talk to friends and neighbors The fairgrounds are themselves a thing of beauty. The buildings and fences are not marred by graffiti and vandalism which shows the respect young residents have for it. Numerous people in the county work hard in preparation for the fair. The people on the board spend many hours working for its continuance. No one receives pay, only the enjoyment of watching others have a good time. Even though the fair is located in Mound City, the various county residents who attend and help, make it truly a Linn County Fair. "See You At The Fair" is one of the advertising themes that has been used for many years. And a person can usually see friends and neighbors at the fair. The fair which helped to heal the wounds of war, economic and natural disasters continues to provide a sense of Community. Bibliography Andreas, A.T. History of Kansas, Kansas State Historical Society, Topeka, KS, 1976 A Little History about Mound City, Kansas, Linn County Historical Society, Pleasanton, Kansas, 1977 Blue Mound Sun, Blue Mound, Kansas, 1907, 1921. Linn County Historical Society, Pleasanton, Kansas Fair Book, The Linn county Fair Association, 1953. Linn County Fairgrounds, Mound City, Kansas. Farm Weekly, The Kirkeminde, Topeka, Kansas, vol.3, 1966 "Kansas in Review", program Linn County Fair Association, Centennial Committee of Linn County, 1961. Larry Blair, Mound City, Kansas. LaCygne Journal, LaCygne, Kansas, Kenea, 1971-1876. Linn County Historical Society, Pleasanton, Kansas. Linn County Clarion, Mound City, Kansas, 1881. Linn County Historical Society, Pleasanton, Kansas. Linn County Heritage, Linn County News, special section, vol. 4, 1982. Linn County Historical Society, Pleasanton, Kansas Linn County News, Pleasanton, Kansas, Fair Edition, 1971, 1985. Linn County Historical Society, Pleasanton, Kansas. Linn County Republic, Mound City, Kansas, Madden, 1906. Linn County Historical Society, Pleasanton, Kansas Minutes of the Linn County Fair Board, Mound City, Kansas, E.P. Landers sec., 1943-44. Linn County Fairgrounds, Mound City, Kansas. Mound City Republic, Mound City, Kansas, Hively, 1936, 1938, 1939, 1943. Linn County Historical Society, Pleasanton, Kansas Records of the Linn County Fair Board, Mound City, Kansas, 1945, 1946, 1985, 1994. Linn County Fairgrounds, Mound City, Kansas. Rodeo Program, The Linn County Fair Association, 1991. Linn County Fairgrounds, Mound City, Kansas. 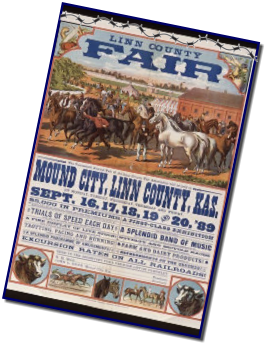 The Linn County Fair, Origin and History by Wayne Schasteen In 1870, still recovering from the Civil War, the first fair in Linn County was held. The passage of the Kansas-Nebraska Act in 1854 had provoked border conflicts and some of the most brutal struggles took place in Linn County. With Missouri on the eastern boundary, Linn County was in the heart of "Bleeding Kansas." The War left many casualties but the pioneer spirit prevailed, and soon this rich agricultural region would yield bountiful harvests again. As a result of this, the Linn County Fair was started. As an event where friends and neighbors met to display the fruits of their labor. It remains one of the largest and best fairs in the state of Kansas. The origin of the fair dates back to pre-Christian times when herders and merchants would come together at festivals to exhibit and sell their wares. During the sixteenth century in England, privately owned marketplaces in the cities largely replaced fairs and livestock markets. In America, some fairs became so large that they assigned certain days for classes of entry, generally providing nightly games and entertainment. The farming regions of the Midwest regarded fairs as the social event of the year. The farmers of Elm Grove in Linn County Set out to have an organized fair. In 1870 and 1871, the Elm Creek Farmers' Club held annual fairs during October in Scott Township, presently known as Cadmus. They had livestock exhibits which could have competed proudly with the best at the Kansas City Exposition. There was hardly a person in the county who would not lend assistance to such an organization, or benefit from it. In 1872, it became the first fair in the county to offer premiums, until that time participants had to attend the Kansas and Missouri fair in Ft. Scott for that kind of competition. Under pressure from county residents the Elm Creek Club incorporated and became the Linn County Agricultural Society. On November 2nd, 1872, they elected officers: President, J.J. Shinkle; Secretary, J.C. Proctor and A.G. Sailor; Treasurer, J.W. Payne; Directors, M.E. Woodard, J.J. Shinkle and Z. Leasure. The site for the first Linn County Agricultural Society Fair in October in 1873 was Farlinville, Kansas. When the failure of a leading investment bank brought on the "Panic of 1873", a depression in the United States that lasted four years, the Agricultural Society did not slow down. A.E. Drigs and W.L. Silsby provided a race track south of Farlinville. Displays of produce filled the newly erected tents and livestock filled the grounds, featuring the finest Shorthorn cattle and Berkshire hogs in the land. One of the most important exhibits of the fair was specimens of lead ore taken from various locations in the county. Other events included carriage horse shows and equestrian events by the ladies who were in attendance, and foot races for the young men. One surprise entry in the races was a young black man. Several white men who entered the race refused to run against him. He easily took the lead perhaps revealing their true motives for not welcoming him into the competition, but the young black did not win the race. Before coming down the home stretch, he turned around and ran backwards. Until the others passed him, giving away the first prize and adding a bit of humility to the winner's ribbon. The first exhibitions' success in Farlinville inspired the society to make greater efforts for the 1874 fair. The proposal of LaCygne Kansas citizens in 1874 encouraged the directors to hold the second annual Fair in their town A meeting of interested citizens planned to lease thirty acres on the north edge of town. Before opening day, the acreage had been cleared, fenced and a splendid half-mile race track was completed, making it one of the finer exhibition spots in the Midwest Despite the combined efforts of cinch bugs, grasshoppers and drought the fair proved to be very successful The usual displays of livestock, produce and sewing gave the crowd d plenty to see A yoke of buffalo shown by Josh Shaefer of Middle Creek added a bit of novelty to the fair. The area equipment dealers demonstrated the newest technology in implements, made to ease the labor of everyday farming. The Linn County fairs took on many changes in 1875. The Agricultural Society in LaCygne purchased the land they formerly leased and built a Floral hall in the form of a Greek cross, along with other various buildings. Baseball added more excitement to the festivities along with baby contests and horse racing. Toward the end of 1875 the Lion County Agricultural and Mechanical Association incorporated purchasing sixty acres of land near Mound City. With J.F. Broadhead as president they sold shares to raise capital for land buildings and an amphitheater. These two agricultural societies exhibited Linn County's desire for progress in the agricultural areas. In 1876 the people of Linn County could attend two excellent fairs. One in LaCygne under the authority of the Agricultural Society and the other in Mound City sponsored by the Agricultural and Mechanical Association. The one in LaCygne was listed as the Linn County Fair. On October the 4th. 5th and 6th. Later in the month, the First Annual Fair of the Linn County Agricultural and Mechanical Association began at Mound City. Many people attended both fairs to see the hundreds of entries from farmers merchants and housewives of the local communities. The competition between the two organizations benefited fairgoers, as each tried to create a larger and more spectacular event. The organization both held fairs over the next few years. From 1884-1889 the Pleasanton Kansas Fair Association sponsored their own fair. During these six years Linn County offered three different fairs for people to enjoy and attendance records show that most people in the area attended each of them. In 1905, the Linn County Fair Association replaced the Agricultural and Mechanical Association. A.H. Mantey purchased the fairgrounds and leased it to the Fair Association each year. The Fair Board then built a one race track and grandstand. The 1906 fair offered some of the most spectacular events yet, complete with balloon ascensions and boat rides. There were thrills for everyone. Over the next few years, the fair reflected Linn County's prosperity. Starting with the Grange picnic and Coach Colt Show in 1907, Blue Mound conducted a main street fair for about the next thirty years, Even though all three towns still held Pairs the one in Mound City grew to daily crowds of 6000 people. During World War I county fairs often demonstrated patriotic themes in support of the troops overseas. After the War Linn Countians enjoyed a bit of prosperity until the stock market crash of 1929. This put the United States in a depression that would last ten years, and leave thousands of Americans unemployed. Despite economic hardship the fairs continued during the early thirties featuring harness races and professional wrestling for everyone to enjoy along with the regular agriculture exhibits. At a meeting of in August of 1936, the directors decided to cancel the fair in Mound City. Because of the continued dry weather, the board believed attendance would be small and agricultural exhibits not very significant. The fair was held at LaCygne in 1936. Even though many displays showed the effects of dry weather, it was a great success for the young people of Linn County. In 1937, a complete fair and stock show began in LaCygne under the sponsorship of the A.T.A an organization joining the Agricultural Society in 1913. The installation of lights let everyone beat the heat and still enjoy the horse show and races after dark. In 1938 the Linn County Fair Association voted to once again conduct a fair at Mound City. After canceling the event at that location for the last two years, the fair board decided on a rodeo for entertainment A parade passed down the main street of Mound City using "Settlement Days" as a theme. The parade featured horses, covered wagons and Pete Data's Cowboy Band. The financial situation of many people kept them from the fair but the addition of the rodeo did help attendance in the afternoons. Both fairs continued until 1940 when the Linn County Fair Association merged with the fair at LaCygne. The primary motive of the fair was promoting agriculture and the livestock industry. The combined efforts provided improvements in every area, encouraging the 4-H and vocational students in the county to do their best. World War II had an impact on the fair During the war, many things were in short supply, People used ration coupons for items such as fuel, sugar, tires and shoes. Many items were contributed to the war effort such as scrap metal, clothing and tires creating a recycling trend much like today's. In 1943, the Fair Board did not lease the grounds from Mr. Mantey. Instead they decided to hold the fair across Sugar Creek near the Mound City water plant. It was advertised in the paper as the 4-H Fair and Crop Show, Sept. l- 3. At the suggestion of Dr. L.D., Mills, county health officer the fair was canceled that year due to increasing cases of infantile paralysis. In 1944, while most people were using their efforts to fight the war on the home front, the fair was canceled once again. The Fair Board, not wanting to slow the efforts of the young people, decided to hold a 4-H show. Since they had not secured a lease for the fairgrounds that year, it was held on the main street of Mound City. Under the management of Carl Teagarden, crops and clothing were displayed in businesses and the livestock were kept in Peatman's used car lot. 1946 brought on one of the most significant events in the history of the fair. Board members set out to sell stock certificates to raise enough capital to purchase the fairgrounds. Many shares were sold and a number of donations accepted. Shares were ten dollars each or half of a share for five dollars J W. Farrar, an attorney for the livestock exchange in Kansas City, helped out by purchasing fifty shares. The Federated Clubs of Mound City acquired twenty shares but most were sold one or two at a time to local residents. This gave the board enough to pay the $5000 needed to purchase the grounds, The Linn County Fair would, as it still does today, have a permanent home. Another important part of the Linn County Fair is the 4-H clubs. Before their existence the baby beef clubs were formed. Many of the counties leading citizens purchased calves, which members of the club raised until fair time. The cattle were then judged, and prizes awarded to the best. Walter Daly came to Linn County in 1927 as the first county extension agent. A full 4-H program was then developed and clubs were given names such as Busy Bees, Willing Workers and Busy Workers to reflect their attitudes toward involvement and community service. Over the years Linn County 4-H clubs have been a strong backbone of the fair. At times when open class entries were not plentiful, the 4-H clubs kept the shelves and barns full giving everyone in attendance a chance to see the efforts of their yearlong work. Midget auto races attracted fans at the 1949 fair. The same troupe featured at the Kansas State Fair in Hutchinson thrilled fans as they turned sharp corners at 40 miles per hour and reaching 70 as they flew down straight-aways. KMBC radio entertainers were top billing at the variety show. The rodeo featured riding, mule racing, trick roping, knife throwing and whip cracking. It was a constant struggle to ensure the continual growth of the fair. Two things happened in 1952 which help to this day. One was the permanent addition of a rodeo. While the rodeo raised attendance, it also brought in revenue from ticket sales. Until this time, the fair usually charged fifteen to twenty five cents for admittance. With the increased money from the rodeo, the admission cost was eliminated and in 1953 it was advertised as the Linn County Free Fair. In l954, the fair signed a contract with Robert's Rodeo from Strong City, Kansas. They were also approved by the R.C.A. which let the audience see many world class cowboys compete. Robert's Rodeo worked with the fair until 1966. The board then entered into contract with Rumford rodeo from Abbyville Kansas, which still provides top stock to help the fair maintain a strong attendance. The second event the fair sponsored in 1952 was the "Queen of the Linn County Fair Contest." The queen contest was another way to ensure good attendance, thus keeping it a free Fair Each queen contestant was sponsored by a Linn County Organization or club The contestant and her sponsor would sell advanced rodeo tickets and whoever sold the most was then crowned queen. The winner received clothing or gift certificates. In later years, the contest was changed to the Linn County Rodeo Queen. Now they receive a percentage of their sales and each contestant wins a trophy buckle if they reach a specified goal. Many times over the years the fair would have a specific theme or idea In 1954, the theme was the Kansas Territorial Days Centennial. It started with a parade through town and ended at the fairgrounds. A pageant that evening entertained the crowd. One of the largest celebrations was in 1961, the centennial of Kansas' statehood. The pageant that year had a wonderful cast of local characters from throughout the county. They acted out scenes from the past including Sister Philippine Duchesne and the Indian mission, Carrie Nation, Jayhawkers and even local African American residents as exodusters. Entertainment has always been a big part of the fair. In the early days there were horse racing, games for the children and music of various forms. Carnivals became a big part of the fair with giant Ferris wheels and games of chance, giving the younger audience something exciting to do. One of the most traditional forms of entertainment, The Cowboy Band made up of local residents to provide music, is no longer in existence. The band performed nightly during rodeos and races and in the annual parade rode in the Mound City Bandwagon. During the 1930s and 40s the band was under the direction of Pete Data and in the later years Harrison Underhill. In the 1980s, the board took a new approach to providing entertainment. They started booking country music performers. Reba McEntire appeared in 1985 when she was chosen as country rnusic's entertainer of the year. The biggest event ever held at the fair was in 1990, when Garth Brooks appeared. Both of these acts were booked prior to their making it big. This gave fair goers a chance to see performances for a fraction of the price they would pay if they drove to a larger city. Over the years the fair has gotten larger, even though the population of the county has declined. Linn County had 12,000 residents during the late l800s, and only 7000 today. Linn County's per capita income is one of the lowest in the state of Kansas. And it also has some of the highest unemployment rates of any county in the state. There is no large town with a, factory or employment base. The largest part of Linn County's tax base is a coal - fired generating station in LaCygne. It is also the largest employer in the county. Mostly Linn County is a rural farm community, a big reason for the popularity of the fair. The fair has had many locations in the county over the years, but it has always contained the same basic format. The hard working people of Linn County displaying their livestock and agricultural products. The people behind the scenes at the fair have always wanted it to be a place for the youngsters, whether they were 4-Hers or just kids wanting to have a good time. It also drew the family unit together, in the early days many people would load neighbors into wagons and make the journey to the fair. In recent time many working parents schedule their vacations around the fair. One of the largest draws people to the fair its simplicity. At a time when every thing is fast paced and high priced a person can enjoy going to the fair. It does not cost anything and you can sit and relax or talk to friends and neighbors The fairgrounds are themselves a thing of beauty. The buildings and fences are not marred by graffiti and vandalism which shows the respect young residents have for it. Numerous people in the county work hard in preparation for the fair. The people on the board spend many hours working for its continuance. No one receives pay, only the enjoyment of watching others have a good time. Even though the fair is located in Mound City, the various county residents who attend and help, make it truly a Linn County Fair. "See You At The Fair" is one of the advertising themes that has been used for many years. And a person can usually see friends and neighbors at the fair. The fair which helped to heal the wounds of war, economic and natural disasters continues to provide a sense of Community. Bibliography Andreas, A.T. History of Kansas, Kansas State Historical Society, Topeka, KS, 1976 A Little History about Mound City, Kansas, Linn County Historical Society, Pleasanton, Kansas, 1977 Blue Mound Sun, Blue Mound, Kansas, 1907, 1921. Linn County Historical Society, Pleasanton, Kansas Fair Book, The Linn county Fair Association, 1953. Linn County Fairgrounds, Mound City, Kansas. Farm Weekly, The Kirkeminde, Topeka, Kansas, vol.3, 1966 "Kansas in Review", program Linn County Fair Association, Centennial Committee of Linn County, 1961. Larry Blair, Mound City, Kansas. LaCygne Journal, LaCygne, Kansas, Kenea, 1971-1876. Linn County Historical Society, Pleasanton, Kansas. Linn County Clarion, Mound City, Kansas, 1881. Linn County Historical Society, Pleasanton, Kansas. Linn County Heritage, Linn County News, special section, vol. 4, 1982. Linn County Historical Society, Pleasanton, Kansas Linn County News, Pleasanton, Kansas, Fair Edition, 1971, 1985. Linn County Historical Society, Pleasanton, Kansas. Linn County Republic, Mound City, Kansas, Madden, 1906. Linn County Historical Society, Pleasanton, Kansas Minutes of the Linn County Fair Board, Mound City, Kansas, E.P. Landers sec., 1943-44. Linn County Fairgrounds, Mound City, Kansas. Mound City Republic, Mound City, Kansas, Hively, 1936, 1938, 1939, 1943. Linn County Historical Society, Pleasanton, Kansas Records of the Linn County Fair Board, Mound City, Kansas, 1945, 1946, 1985, 1994. Linn County Fairgrounds, Mound City, Kansas. Rodeo Program, The Linn County Fair Association, 1991. Linn County Fairgrounds, Mound City, Kansas.